Also known as EXCEL, adventure-based learning provides participants with opportunities to participate in activities that challenge and encourage them to stretch beyond their perceived or self-imposed limitations. This approach helps participants to not only discover untapped resources and strengths but also explore their problems and challenges rather than become overwhelmed or incapacitated by them. Through participation in a gradual progression of activities that require cooperation and positive interaction with others, we create a supportive atmosphere to help participants take safe social, emotional and physical risks. Our “Challenge by Choice” approach allows participants to choose their own level of participation, and no one is ever forced to do more than they are comfortable with and ready for. 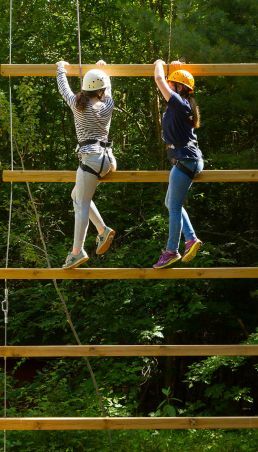 The peak experience for many participants involves the use of a High Challenge Ropes Course and climbing wall. These activities, which involve elements that are up to 40 feet off the ground, are supervised and operated by a highly-skilled and trained Adventure Program supervisor assisted by trained and experienced Adventure Program leaders, who follow stringent safety procedures and guidelines. As every Adventure Program activity allows for different levels of participation, if a participant chooses not to actually “climb” or do a high ropes course element, they can play a supportive role for other participants, which is just as rewarding and beneficial. Processing the participants’ experiences in meaningful ways allows for the transfer of learning and outcomes back to home, school and community environments. Participants work with their cabin mates to learn and practice outdoor skills and make all the necessary preparations for canoeing/outdoor trips in beautiful wilderness settings. In addition to gaining an awareness of and respect for their natural environment, participants develop confidence in their ability to work with others and contribute positively to a powerful and meaningful group experience. All trips are accompanied by a trained and qualified trip leader who possesses a minimum of Bronze Medallion, Standard First Aid and CPR and extensive canoeing and tripping experience. Towhee’s fun and recreational swimming programs allow each participant to work toward their desired level of comfort in the water in a safe and supportive environment. All activities are supervised by a highly qualified team with certification by the National Lifeguarding Society. Through engaging and challenging activities adapted to each participant’s individual needs and abilities, children/youth are able to experience positive social interactions and build self-confidence while enjoying the beautiful scenery of Hurricane Lake. Facilitated by creative arts therapy students, arts educators, artists and musicians, Towhee’s Experiential Arts program is divided into two streams: music and fine art, with a drama component present in both streams. The group leader and participants establish individual and group goals at the beginning of the session, placing the focus on process and exploration rather than the final product. The music stream comprises fun, non-performance based activities where participants are exposed to percussion, guitar and piano during the one-hour sessions. Participants have the opportunity to contribute ideas that reflect their own interests in order to get the most out of the program. Some past examples of programming include song-writing, radio interviews, drum circles, drawing/meditation to music, lip synchs and musical/dance performances. Participants also have the opportunity to learn or work on musical skills (guitar, piano, bass, percussion) if they desire. In the fine art stream, participants are introduced to an array of materials such as clay, papier mâché, wood, plaster, paints, oil pastels and pencil crayons. 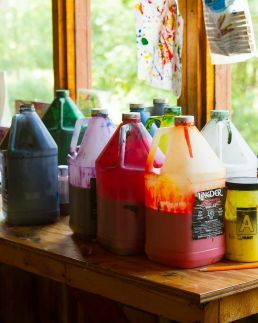 Participants are encouraged to explore all of these materials while also using the natural resources of the Towhee environment to create their work. The group also spends some time on the creation of traditional “Towhee crafts” such as beading, candle making and woodworking. In addition to creating music and fine art, many participants take on a leadership role in creating and participating in plays and performances throughout the Towhee session. Improvisation and drama clubs are also available for participants who love to role-play but not perform. In addition to the four program areas described above, participants have the opportunity to participate in cabin group activities with their cabin counsellors, special Towhee-wide evening programs and theme days, special interest clubs such as the “Towhee Tribune” newsletter and day trips away from Towhee with their cabin group.